Ever since I was very young I have loved being in the water, river lake or ocean. Growing up in New Zealand, one is never far from either. I also spent time trying to teach nephews and nieces and cousins to submerge their faces. Lo, I didn’t even know what I was doing! Forward a few years and I went to Otago University to become a schoolteacher, and the teaching began in the classroom and eventually transferred to the pool, when I married and had my first child, Peter. Peter was my first student, and believe me, I had no manual to follow, just trial and error and a great deal of common sense and lots of love! 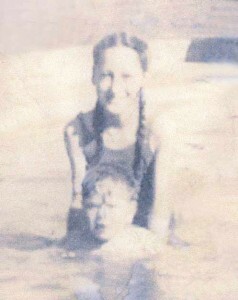 Our family of three moved to the USA when Peter was 4yrs old and he could swim already, back then(1966), that was incredible! Our second and third sons were born during the next two years and the water tuition continued. As I progressed with their lessons, certain skills began to make so much sense, for one thing, patience love and repetition, repetition repetition, which is incorporated in large doses into my classes today. I was on staff at the Vanderbilt Swim School during the late 70’s and 80’s and then a couple of years at the original NAC in West Nashville. Many hundreds of children have participated in the Bubbles and Roll swim program. I am exceedingly proud to say that I have many of my former families returning with their beautiful grandchildren! My staff and I look forward to many more years of teaching and loving every minute of the special families and children that will touch our lives. It has been a long and joyful journey and I thank God for the blessings of everyone who has touched the lives of my staff and family over the years. Thank you! My middle and youngest son, Mr Brendan and Mr Gareth have the same programs so the methods are being continued. Look for them on the Web!